Easy tips to make sure the corporate yoga session at your workplace turns out to be a hit with your staff. Seven tips to make sure the corporate yoga session at your workplace turns out to be a hit with your staff. Thanks to my experience of teaching yoga to employees at corporations, I have gained a few important insights that can help you in organising a corporate yoga session for your company’s staff. Keep these suggestions in mind and you will maximise the benefits for your organisation and staff. Always have a theme for your session. This is important because it allows the trainer to tailor the session to the specific theme and stick to it. The theme could be common issues like sleeplessness, neck pain, lower back pain, acidity/indigestion, improving concentration or the all-time-favourite, weight loss. This way, employees will know what to expect. Those who are facing that specific challenge will be particularly attracted to the session, and you can expect a healthy rate of participation from them. You might choose the trainer based on a friend’s recommendation and seal the deal because he or she fits the budget allocated for the activity. But do check on the style of yoga that the trainer specialises in. For the introductory session, it’s best to choose someone with experience in Hatha Yoga as that is the traditional form of yoga and will introduce your staff to the basics. It’s also the safest, if done correctly. Resist the temptation to introduce power yoga or any other adaptation of yoga in the first session itself as not everyone may be able to keep pace with it. Remember, some people who come for the yoga session may not even recall the last time they did any physical activity. For them, sitting crossed legged on the floor or doing asanas will be a BIG challenge. But there would be others who come to the session wanting to learn something new and challenging. So based on the theme, you can ask the trainer to start the session with beginner level poses and then move progressively to intermediate level. It’s best to leave out advanced level poses as they need personal attention and the trainer needs to know the limitations and comfort level of each participant. All your efforts will go waste if you don’t pay attention to the date and time and inform your staff in advance. Make sure not to plan the session on month ends, when the staff is likely to have more workload; just before or after long weekends is also a no-no. As for timing, best time is in the evening around 4–5 pm. On the morning of the appointed day, send an email to everyone who has registered for the session, reminding them that they need to finish off their lunch at least three hours prior to the session. Also, keep at least 15 minutes after the session for people to cool down and also clear their doubts. Just because it’s corporate yoga does not mean it can be performed in corporate wear. I have had people show up to the sessions in outfits like skirts, tight trousers and even saris! Insist on changing to work-out attire so they can move freely, comfortably and make the most of the session. Yoga is no fun without a yoga mat, so your work is not over till you have organised for those. Where do you source them from? Check with the trainer if she can get a few, and ask participants to carry theirs; you could also hire a few. If you are using a carpeted area, participants can carry a full length towel in place of a mat. Whether you are using a large conference room, or converting the cafeteria into a make-shift yoga hall, you will need to ensure some hygiene factors. The floor must be absolutely clean and the room should be quiet. Make sure that the session does not get disturbed by sounds from outside. A music player for some relaxing music in the background is a great idea; lighting aroma candles or incense makes the participants feel welcome and gets them into the mood for yoga. Corporate yoga sessions are organised in many workplaces, yet few participants continue with the practice afterwards. A little planning can go a long way in making the session enjoyable for your employees and some may even take to doing it regularly. 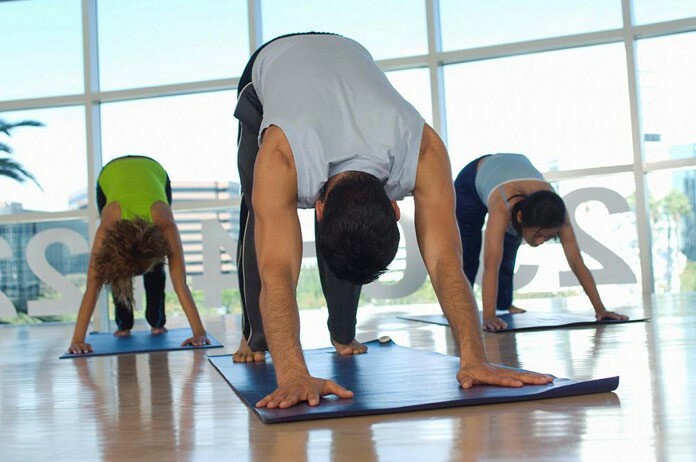 Setting up a Corporate Yoga class at your Workplace.